I got the ASIC version of the CosmoEx v2 that I got for my atari ste. well, that machine is out of commission due to a dead psu so in the meantime a mega ste appeared and well, it's the best ST line machine so I got it. 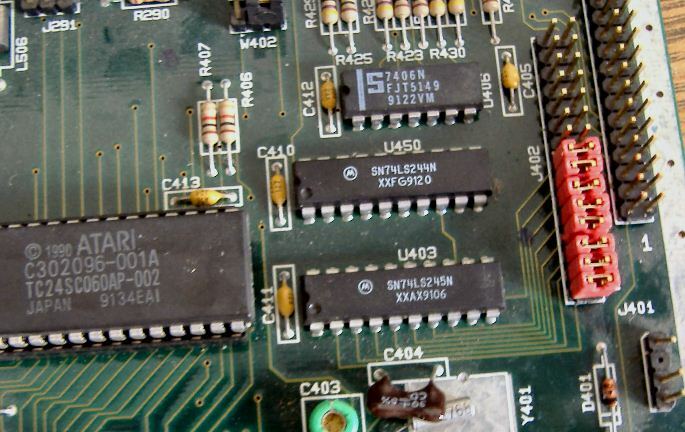 "Please be also advised that your CosmosEx is not working well as an internal Harrdrive in a Mega STE – this is due to Ataris ACSI/SCSI bridge card, which unfortunately only supports one SCSI ID. For full operation you need at least two." So I can't use it as internal harddrive, as internal scsi harddrive (which mine doesn't support anyway since its asic only) or not at all? That's just not correct what they say. Why I say it with so great confidence ? Simply because I used internal ACSI/SCSI adapter and external UltraSatan at once. And I wrote driver SW for it. All goes via "ACSI/SCSI bridge card" - ah, even that's not correct. That's called adapter, not bridge normally in Atari waters. Maybe some PC motherboard influence ? Or some simple adapter what will connect those pins - may be not directly, but via line transceviers. Solution is to do same as Lotharek did with UltraSatan - special adapter for internal connection. I don't have CosmosEx, so I was not able it on my Mega STE. It may be that it really works not well with Mega STE. But then, the reason, explanation is something other. 1. Removing internal adapter and hard disk and using special adapter like it is done for UltraSatan. 2. Keeping internal drive and disk inside - then it is little harder, but possible to connect to lines which lead to external ACSI port. Of course, need to set different IDs for all 3 targets . Edited by ParanoidLittleMan, Thu Dec 20, 2018 4:14 AM. Might not be the answer you're looking for but it works fine externally with Peter's drivers. There's no difference in the boot process or usage compared to an internal hard disk which i have removed anyway.